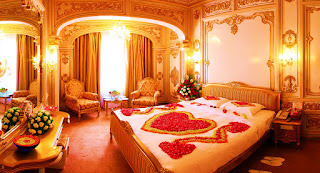 The most romantic celebration of the year is undoubtedly on February 14th, Valentine's Day, therefore, do not miss the opportunity to surprise the person you love, not with the classic gift, or the classic dinner, but with a decorated bedroom and an unforgettable evening. 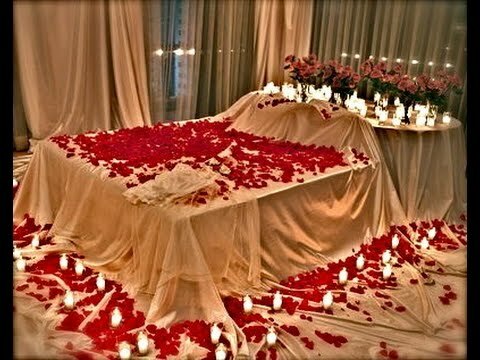 Remember that the ideas we present are not only simple, but very beautiful and the most important, if you wish you can replicate them in a hotel room, but they would also be perfect in your apartment or house. In this first image we have a bed with three pillows, each one with a red rose, on it you can see the phrase I LOVE YOU and a red heart, all this formed with rose petals, in each corner were placed two ornaments with a red rose in the middle. 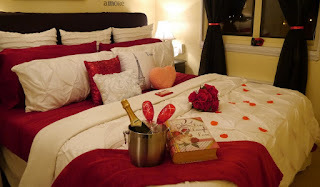 One more time we have a big heart on the bed formed by red petals and three white swans with petals of the same. 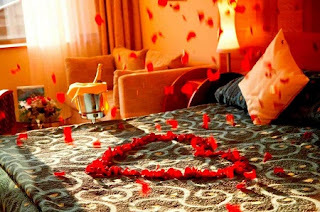 In this image we have a room with red balloons in the shape of a heart, some red petals decorating not only the bed, but also the floor, the same ones that were used to formed a heart on the bed. If you think petals are not enough, you can add lighted candles. 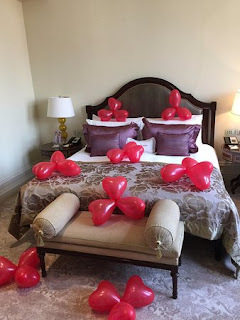 Tender way to surprise your special person, we have a bed full of red, white and pink balloons in the shape of a heart and a white teddy bear with kissing marks. 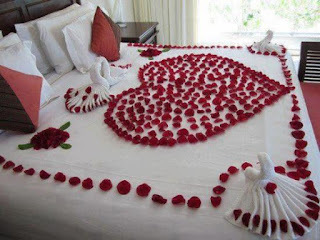 Again we have a bed with hearts, but in this case, they are hearts formed by three balloons, placed on the bed and the floor. The perfect combination for an unforgettable night, the bed full of red petals and on the table, a bottle of champagne and two glasses. 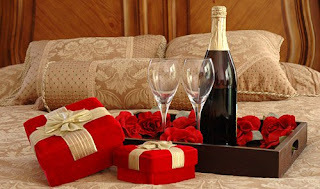 In this image we have a heart formed by red roses, some petals of the same color and in the corner, a bottle of champagne with two glasses and a photo album. Hearts in silhouette formed with red rose petals always give very good result. 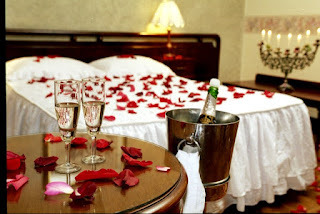 A sober, elegant and simple way to surprise the person you love, it is a tray with red roses, a bottle of champagne with two glasses, and to complete the surprise... a gift. There are hotels that also offer the service, not only provide beautiful rooms, but their decoration.